Marty Appel took this great photo just a couple of days ago at Yankee Stadium. Spring Training is right around the corner. 20 days until pitchers and catchers report to Tampa. I took an English course this past semester at school, and the main theme of the class was “Spectacle”. For our final paper, we were able to choose a topic that we thought fit that category, and I chose George Steinbrenner’s reign as owner of the New York Yankees. The purpose of my paper was to show how the different personality traits that he possessed led to success in many different aspects of his job. George M. Steinbrenner III has gone down in the record books as one of the most controversial and successful owners in the history of sports. His demand for excellence and his hunger to be the best did not always put him in a good light with the people he worked with, because he was stubborn and wanted to do things his way. During his reign as owner with the New York Yankees, he had run-ins with authorities, MLB officials, players, and team personnel. If things didn’t go according to his plan, he would take matters into his own hands, berating players and messing around with the minds of his managers and employees. Even though many of his tactics were thought to be unethical, Steinbrenner transcended the game of baseball in the process by: bringing about the development of free agency, having the first organization to own and operate its own television cable network, controlling the back pages of the newspapers, and changed the way other clubs ran their teams. These developments allowed the fans to forgive and forget about the stunts Steinbrenner pulled. It was his attitude, competitiveness, larger than life personality, and his generosity that allowed his to shine the brightest in the biggest media market in the country. These personality traits were critical factors in his success as an owner: financially, on the ball field, and with the media and fans. 162-0: Imagine a Yankees Perfect Season. The Greatest Wins! Marty Appel has come out with a new book 162-0: Imagine a Yankees Perfect Season. It’s a must read for any Yankee fan. The book delivers the greatest wins of all-time in the history of the New York Yankees. Do you ever dream of the Yankees having a perfect season? Well, then this book is for you. Even the greatest baseball teams lose 30 percent or more of their games each season. The 2009 New York Yankees are a perfect example of that, as they won 63.6% of their regular season games and went on to win a championship. A little bit more about the author: Marty Appel: Former New York Yankees Public Relations Director and thier Emmy Award-winning TV producer, is the author of 18 books including the New York Times best seller Munson: the Life and Death of a Yankee Captain, the Yankees classic memoir Now Pitching for the Yankees, and collaborations with Tom Seaver, Bowie Kuhn, Larry King and umpire Eric Gregg. He runs Marty Appel Public Relations (www.AppelPR.com) out of New York City. Appel graduated from SUNY Oneonta in 1970 with a degree in political science. You may ask yourself, how did he get involved in sports? While in high school, he was a by-lined reporter for the local newspaper in Rockland County, NY. He also wrote a page news feature in addition to his sports reporting. His interest in communications grew as he was serving as a sports editor and then editor-in-chief, for school newspapers. Later on, he became the editor of the campus newspaper in college. Appel also had the pleasure of being educated by the man considered to be the founder of the PR profession, Edward Bernays. While a student, he kicked off his career by writing a letter to the Yankees Public Relations director at the time, Bob Fishel. In 1967, Fishel hired him to answer Mickey Mantle’s fan mail because it was not getting answered. That’s how it all started. It was a major break for him and it opened the doors wide open for the 19-year-old. He went right from college to the New York Yankees. Marty had the chance to interact with one of the most iconic sports figures of all-time. His name was Mickey Mantle. He was starstruck, and he couldn’t believe the fact that Mickey Mantle even knew who he was. The Mick liked Marty, and he would even hand him all his gift certificates he recieved when he did radio interviews, such as $10 off Thom McAn shoes. He stayed good friends with Mantle until he passed away, and he claims that the “awe” factor never fully went away. Shelley Duncan signs with the Indians. Ken Rosenthal reports that Chien-Ming Wang’s latest check up was positive. He could throw off a mound in 6-8 weeks. A.J. Burnett turned 33 years-old yesterday. We wish him a belated Happy Birthday. On December 28th, Jon Heyman tweeted that the Yankees don’t appear to be in on Jermaine Dye. He said that the Rangers, cubs, Giants, Braves and Angels were more likely suitors. Those Yankees Italian American Baseball Heroes…. Marty Appel sent over this fun product that recently came out. The National Ethnic Heritage Foundation has released an Italian American Baseball Heroes Card Set. This is a must for any baseball fan or card collector. The Yankees seem to have more Italian stars than any other team. The set includes: Lazzeri, Crosetti, DiMaggio, Berra, Pepitone, Giambi, Torrre, Girardi, Rizzuto, Pettitte, Martin, etc. Yankees PR man, Marty Appel, is handling the publicity for this book and he wanted me to share it with my readers. It’s called: Perfect: Don Larsen’s Miraculous World Series Game and the Men Who Made It Happen by Lew Paper. In the 105-year history of the Major League Baseball World Series, 606 games have been played, with 1, 212 starting pitchers. Of those, 218 have pitched for 9 innings or more. Only one World Series pitcher has gone nine full innings and retired 27 batters with zero hits and zero runs. That pitcher is New York Yankee Don Larsen, and his incredible feat on a warm October afternoon was the “greatest moment” in World Series history according to The New York Times. PERFECT is the amazing inning-by-inning breakdown of Game 5 of the 1956 World Series where the New York Yankees were pitted against perennial rivals the Brooklyn Dodgers. There hadn’t even been a regular season perfect game in 34 years. These are the stories of the 19 people who had the best seats in the house that October day – the 19 players who actually appeared in the game. Author Lew Paper spent six years researching and interviewing players, managers, reporters, and families of those legendary players who took part in the historic match-up. In a remarkable telling of both the game, and of these players’ stories, author Lew Paper has created a unique contribution to baseball literature, and the story of baseball in mid-20th century. Some were famous, some obscure, but all were together in Yankee Stadium on that one day to witness and take part in history. PERFECT also provides another perspective into some of the most explosive issues that continue to prompt debate among baseball fans, such as then St. Louis Cardinal Enos Slaughter’s slide into and spiking of Jackie Robinson and whether it was intentional or an accident. From racial and ethnic discrimination to less than ideal traveling conditions, small salaries that required players to have jobs in the off season, and the broken marriages that resulted from careers and lives spent on the road. 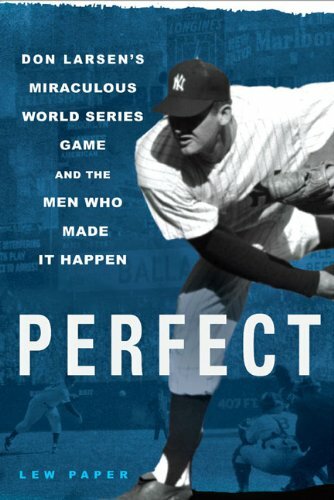 PERFECT is an affecting and meticulously researched celebration of the players who witnessed and contributed to the only perfect game in World Series history.